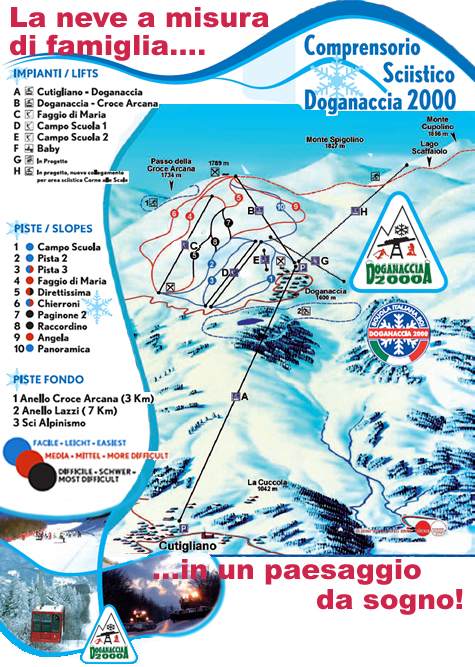 The ski resort of the Doganaccia range over about 15km of downhill slopes. The school field, considered the most beautiful and varied of the Montagna Pistoiese, is served by a free 60-meter tapis-roulant perfect for the first approaches to skiing and snowboarding and a skilift (Campo Scuola) of 800 meters and lies on a vertical drop of about 120 meters. From the last one, moreover, it is possible to access the rest of the area: from here the Campo Scuola, Uno, Due, Tre and Raccordino slopes start. The Faggio di Maria ski lift serves, in addition to the homonymous trail, the Direttissima, the lower part of the Chierroni, and the almost 4 km long Panoramic slope. The second section of the cableway, from Doganaccia to Croce Arcana (currently under maintenance) allows the use of lots off-piste areas within the skiable area, the first section of the Direttissima and Faggio di Maria slopes, and the Angela and Panoramica pistes. The ski mountaineering route, which connects the Arcana Cross to Mount Cornaccio (Corno Alle Scale-Rifugio Duca Degli Abruzzi-Lake Scaffaiolo), can be reached by the Doganaccia-Croce Arcana cableway (currently under maintenance) or by following the marked routes. Another very striking feature is the Romea Road towards Capanno Tassoni. All the tracks are passable both with mountaineering skis and with snowshoes. It is advisable to always check snow and weather conditions before facing these paths. The wide open spaces that open above the vegetation are a popular destination for snow kite enthusiasts and an ideal starting point for paragliding. Two cross-country trails are developed for 2.3km around the Lake of San Gualberto and at a height of 3.2 km at the Passo della Croce Arcana. Currently both are used for wonderful snowshoeing in contact with nature.